Practice: We’ve all engaged in it: piano, math, golf, flying… Usually practice involves a modicum of coaching, self-help and repetition. In avionics development, however, there is little time for practice; instead, everything counts. And the result has little margin for error: Schedules, budgets and particularly safety are all on the line. How then can “practice” be reconciled with “avionics development”? The best answer is to understand the breadth of worldwide development and glean the best knowledge and solutions from the aviation ecosystem. Welcome to DO-178C Best Practices. The following pages provide the DO-178C Best Practices which can minimize all six of these important attributes in your development. Certain good avionics software development practices are self-evident. Similar to improving human health, educated persons know that improved diet, exercise, sleep and stress relief are all “best practices”. For software, the obvious good practices include utilizing defect prevention, experienced developers, automated testing and fewer changes. This paper isn’t about the obvious, as it is assumed the reader is educated by virtue of making it to this page. Instead, the DO-178C Best Practices identified herein are subtler and considerably less practiced. Requirements are the foundation of good engineering. Detailed requirements are the foundation of great engineering. Smarter researchers than this author long ago proved that most software defects are due to weak requirements. In the book, Mythical Man Month, Brooks opined that assumptions were a leading cause of software defects. DO-178C was intentionally strengthened over its predecessor DO-178B to ensure acceptable requirements via 178C’s mandate to trace structural coverage analysis to requirements-based tests (RBT). Remember: DO-178C doesn’t provide strict requirements standards, but for DAL A, B, and C, the developer must. Those standards should define the scope and detail associated with HighLevel Requirements (HLR’s) and Low-Level Requirements (LLRs). Ideally, the Requirements Standard will include examples of HLR’s versus LLR’s. Requirements review checklists should likewise contain ample criteria for evaluating the level of detail within LLRs. If a tester cannot unambiguously understand the meaning of a software requirement, how could the developer? DO-178C is agnostic regarding cost and schedule: The developer is freely allowed to be behind schedule and over budget. 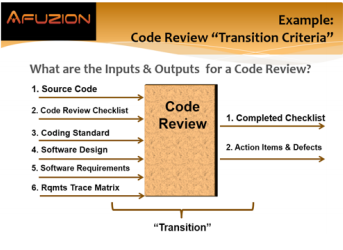 While transition criteria must be explicitly defined for all software engineering phases, it is normal for companies to define their test cases after the software is written. However, great companies define test cases before code is written. Why? Because it’s better to prevent errors than detect them during testing. If a tester cannot unambiguously understand the meaning of a software requirement, how could the developer? Good companies verify requirements independently by having the software tester define test case as part of the requirements review, before any code is written. Requirements ambiguities or incompleteness are corrected earlier, yielding fewer software defects and expedited testing. Requirements Standard. Design Standard. Coding Standard. Testing Standard… Wait, there ISN’T a Testing Standard?!? Software modeling will eventually fade away … when software functionality, complexity and size all decrease 90%. There are few safe bets in life, however this author claims continually increasing software functionality, complexity and size are all safe bets. As exercise will help manage a high-fat diet, software modeling better manages tomorrow’s software. However, models and modeling techniques can vary greatly. Large variation within a project defeats much of the benefit of modeling, particularly within verification and reuse. Best practice? Use model frameworks and specify these in the project’s Design Standard. Independently review these frameworks to explicit criteria (using a checklist), control them and require their usage. This author has never seen a ten-engine airplane, but he’s seen many peer review teams with 10 engineers. Why so many reviewers? Was it optimism? Pragmatism? Perhaps simple naivety: Human nature is replete with more-is-better examples. However, in the case of software reviews, one great reviewer is the better choice. One great reviewer is more cost-effective, more productive, and with proper skill, better. When a rowboat is paddling away from an incoming torpedo, one oarsman will work harder than many. Human nature is human and reviewers perform better when they know they are the sole reviewer. DO-178C requires regression analysis whereby software updates are assessed for potential impact to previously tested software with mandatory retests required where potential impact exists. Over the project life, and absolutely over the product life, more time will be spent on testing than on development. 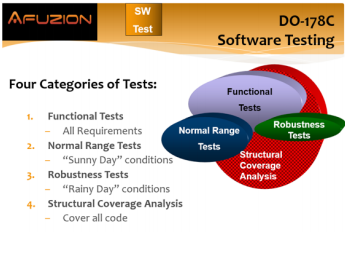 Many consider software testing to be the largest line-item expense in DO-178C. 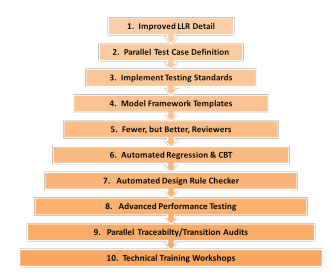 Devoting upfront time to develop a test automation framework can provide the single largest expense reduction ability. And continuous-based testing (CBT), which automatically retests changes continuously, is the best means to meet regression objectives. Why? By continuously retesting all software the regression analysis is greatly simplified: Just repeat all the tests by pressing a button. Voilà. On their best days, humans perform satisfactorily when checking software design rules; in the safety critical world, not all days are best days. The safety-critical software world is replete with tools and techniques for performing static code analysis, automating testing, structural coverage, and model based design. Wonderfully helpful, even necessary. However, if an imperfection can be considered a defect, then the aforementioned activities miss an entire area of defective design. Consider: A leading cause of software defects is assumptions, hence the need for detailed requirements, traceability, coding standards, etc. However, different humans have different assumptions regarding software design and internal interfaces. These different assumptions yield imperfectly coordinated software components and these imperfections may mask defects. The remedy? Automated design rule checkers which help ensure consistent, deterministic interfaces and execution. Combined with the model framework templates of #4 above, a most powerful combination results. Would you want to buy a new car model which has never been tested in aggressive driving conditions? I live in Los Angeles and Manhattan; me neither. Utilizes worst-case Parameter Data Items (PDI’s) where each PDI is deliberately chosen for WCET impact. For additional details on this white paper topic, or formal training, avionics software design, development, verification and certification, contact Vance Hilderman. For DO-178 & DO-254 specific details, procure the book “Avionics Certification: A Complete Guide To DO-178 & DO-254”, from major bookstores such as Amazon.com. (The author of this white paper is the primary author of that book.) Also, the new book “Avionics Development Ecosystem” by Vance Hilderman covers the big-picture view of avionics development from safety, to systems, and through all key regulatory and design aspects for modern avionics development. See the Afuzion website, www.afuzion.com, for advanced training modules relevant to DO-178C beginners and experts alike. Vance Hilderman is the founder of two of the world’s largest avionics development services companies. He is also the developer of the world’s first training in DO-178 and trainer of over 8,000 engineers in 45 countries in DO-178, DO-254, DO-278, and DO-200A. He is also the primary author of the world’s first and bestselling book on DO-178 and DO-254.